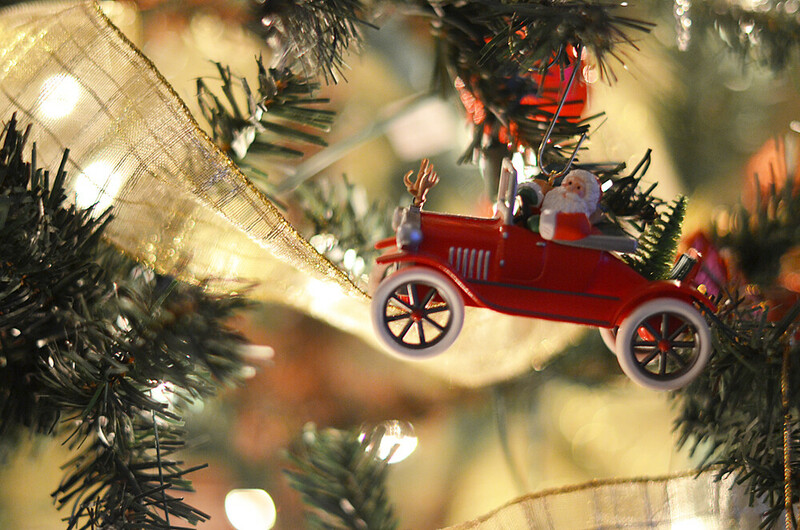 357/365 :: My mom's tree. She has tons of 'Here Comes Santa Claus' decorations. I used to love taking them out of the box at Christmas time and seeing what year each one was from. 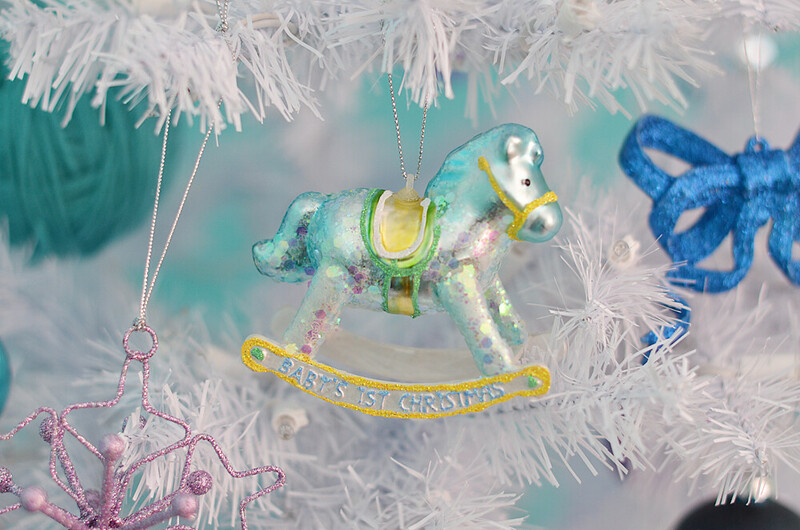 358/365 :: A beautiful ornament for Milo from one of my friends. 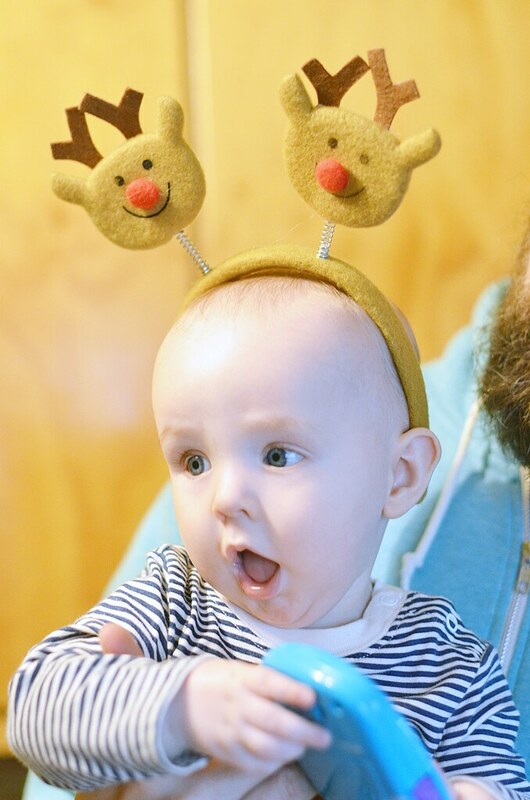 359/365 :: Milo's first Christmas! 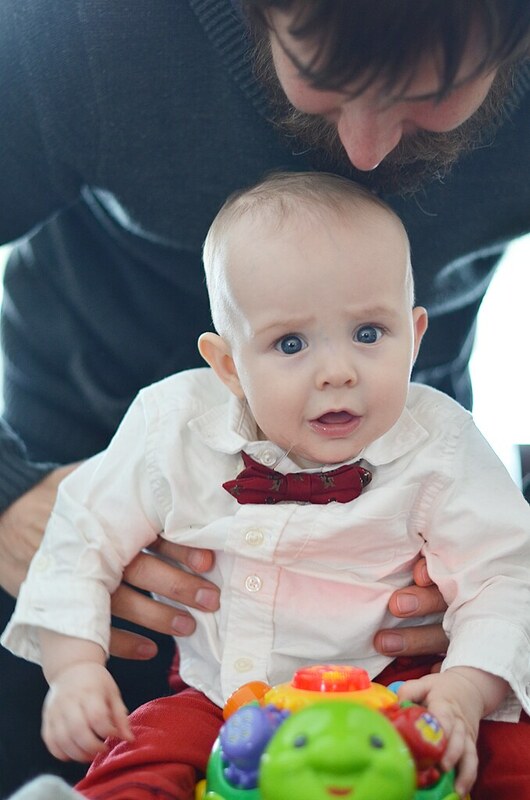 I like his, "what the heck is going on here" face. 360/365 :: Ivan and I have been juicing a lot lately. 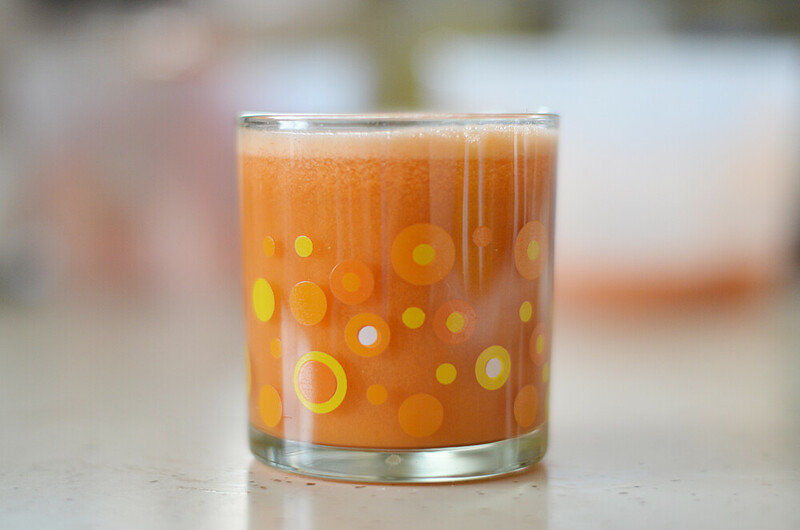 This carrot apple juice is my favourite. 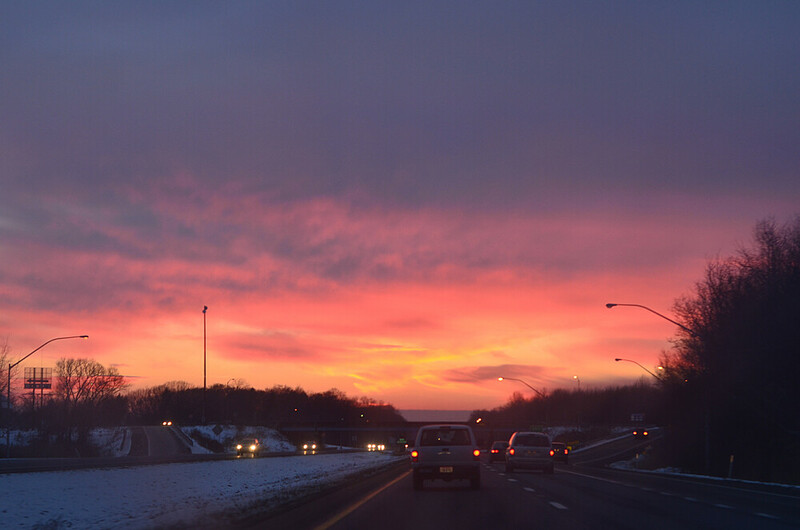 361/365 :: After a long day in the car on the way to Ohio we were treated to a beautiful sunset. 362/365 :: Leaf is the sweetest kitty ever. He looooooved Milo. 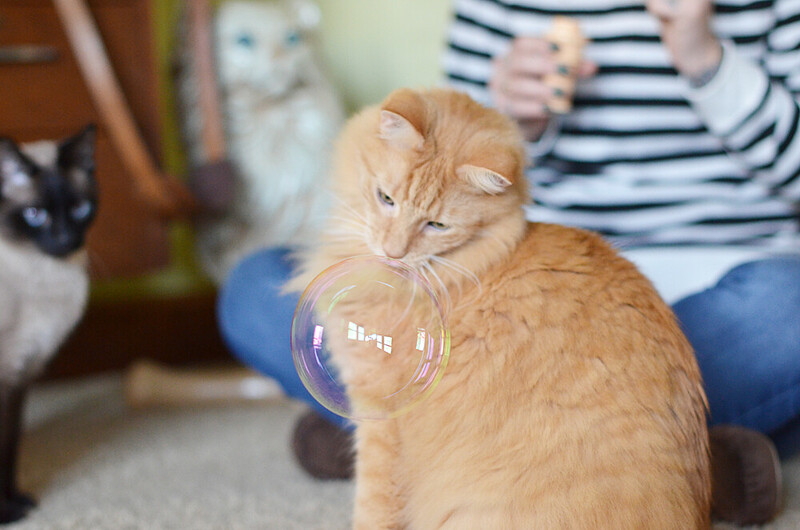 363/365 :: The colour in this photo is pretty awful...but look how cute!! 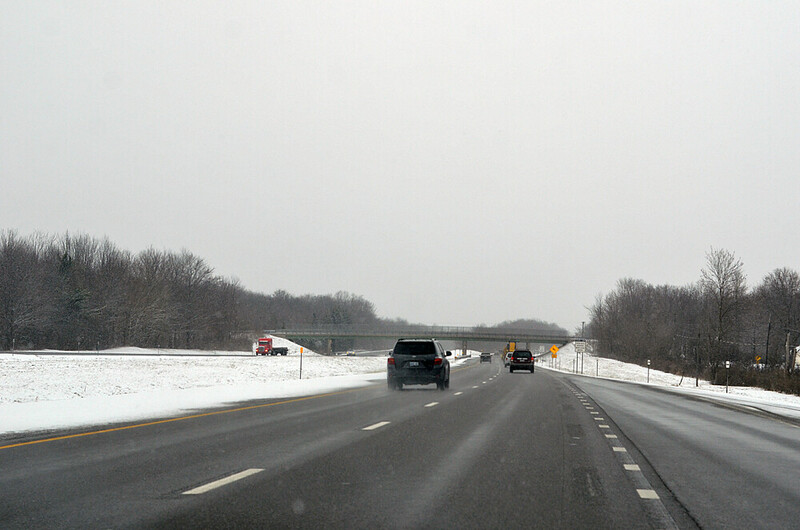 364/365 :: A bit of snow on our way back home. We had a great visit with our friends and we miss them already! 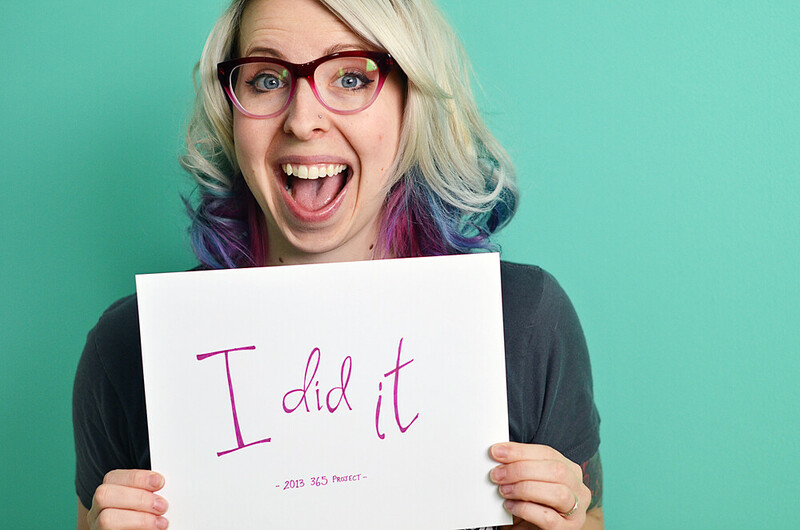 365/365 :: I did it!! Happy New Year!! I am sneaking in quickly while cleaning the house to bring you the final installment of my 2013 365 Project. I really loved doing this project and I think the thing that made it most enjoyable was the no-pressure approach I took to the quality of the photos. In the past I had the idea that every photo needed to be something special but with this photo a day I really just wanted to capture a simple snapshot of each day of 2013. I am continuing my photo a day project into 2014 with one little change. On the first day of the month I want to take a photo of something that says the name of that month. Pretty simple, I think I can remember that. I like the idea of having little markers throughout and I'm excited to use some of my month glasses as photos! Are any of you planning any special projects for 2014? I have a few more simple things that I'm thinking of doing but I'll think about it and tell you more later. I hope you all had a safe and happy new year. Thank you for sticking around with me over here; I am looking forward to getting in a bit more blogging in 2014! Congratulations on completing it! I've decided to attempt a 365 project this year! Happy New Year to you too Alycia! Oh that sounds awesome! I should try to do at least a granny square a week so I can maybe one day finish the huge blanket I started a long time ago. Congrats on the project, I loved looking through it! I'm starting a 365 project this year, it will be my 2nd one. Let's hope I can stick with it, haha! 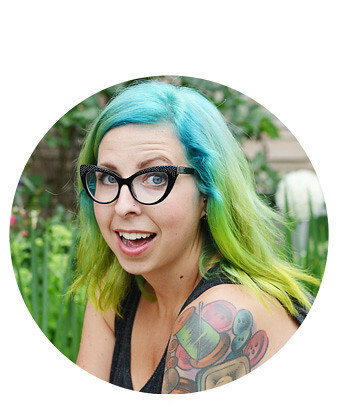 I've always loved your photo a day project and admired you for sticking with it! I'm going to try to do a 365 second video project, 1 second of video every day. Fingers crossed! I've decided to do a 365 photo project this year. As it is, my blog (partyweetow.blogspot.com) is mainly photos, but since getting a job in October, I haven't had much time to go out and shoot for hours at a time. I'm hoping this project will help encourage me to take one or two pictures a day to still get my photo fix in. Your photo is last photo was a great way to end your project! I've enjoyed seeing your photo project. And, you actually were part of the inspiration for me to start my own 365 photo project on my blog! Hurrah! I'm so proud of you for finishing! It was really cool seeing bits of your year. Glad you had a wonderful, blessed, and happy 2013! Congrats! Looking forward to Project 2014! Hurray! Not even gonna lie, I love the photo of you on the last day celebrating... the most! wow, congrats on completing the full 365! it seems so hard for me! but I like your approach to it! Congrats on finishing a whole year of photos!! It's a serious accomplishment... :) I've never been able to stick to it, myself! Any tricks you found helpful? I hope you had a lovely holiday...and happy New Years!